[ Editor’s note: We had to sit on this report until…well, we can’t even say that either. As Jim Dean points out, this is material you won’t find anyplace else. This is not an article, authorship is not attributed and will not be by us. You are getting a peek at “what you see is what you get”. This is an unedited raw Intel report from very competent sourcing…as good as there is. We got it based on our past track record to make good use of it. There are people who think that the public actually needs to have a realistic idea of what is going on so they can measure how well their leadership is dealing with it, or not. Is anyone in control of any of this? It seems that your window is up and running again. I couldn’t get anything through to xxxxx since xxxxxxxx. To me that’s just further proof of the extent to which ‘they’ are close to shutting down all venues outside of their direct control. As you seem to be almost literally the only place left outside of the hasbara “control both sides of the opposition” juggernaut, let’s give your readers a bit of the real story about things here in the Middle East. I will hold off from discussing the nature of the ties between Turkey and Israel, though, as that seems a good chance to have been behind the cut off in communication. Do not be misled into believing rumors of Turkey’s advance into Syria. Although the usual suspects in the ‘alternative media’ have been quick to announce such an entry that is simply a click-bait fabrication. Without the direct ‘boots on the ground’ participation of the US, or at very least, a coalition including major NATO players, neither Turkey nor the Saudis are going in by themselves. However, there has been a major development which changes the internal dynamics of Turkish politics in such a way as to quite possibly rule out the chance of it in any circumstance! There have been recent reports on the part of armchair analysts playing up the idea of the Turkish Second Army moving into the disputed region between Azaz and Jarablus in northern Syria, in order to prevent further advances of the PKK-allied Syrian Kurdish forces – as well as to prevent their jihadi proxies being cut off from supply lines originating in southern Turkey. Even were this 100,000 strong armed force mobilizing for a foreign incursion, a simple look at the troop positions these reports are based upon would call into question the whole notion of a move in said direction. The greater part of that group’s troop strength remains poised around the southeastern segment of the border, very much in proximity to those parts of Turkey’s Kurdish majority provinces where a virtual state of siege has reigned for over three months. If those same elements were to be withdrawn now to be redeployed in the far western zone above Aleppo as claimed, it would be an invitation for the PKK to send fresh fighters and equipment into the most unstable and contested part of the Turkish border region. When I wrote xxxxxxxxx about the pending movement of Turkish armed forces through Iraq in preparation for a campaign against Kurdish YPG forces along the northeastern border with Syria, there was every willingness on the part of the military General Command to take this action – as opposed to their unilateral refusal to make any such incursion into the central or western parts of the shared border with Syria. It had a plausible chance of success -via surprise- and a low level of potential blowback. All the pieces seemed in place. First, the longstanding presence of Turkish troops already in the breakaway Kurdish part of northern Iraq gave precedent; and armored columns whose movements could be more or less hidden due to the absence of Iraqi control, along with complicity on the part of their Kurdish allies in Erbil would be free to pass themselves off as part of a force moving against the jihadis in Mosul. Secondly, being outside of the range of Russian aerial forces operating from the Latakia region on Syria’s Mediterranean seaboard, the necessary air force protection of ground units could be counted upon. The government in Ankara has recently claimed that PKK opposition in Cizre and other towns has been snuffed sufficiently as to allow a withdrawal of army personnel. There was every reason to expect such forces could be speedily reassigned to the pending plan for a pincer action against the part of the Syrian northeastern border with Turkey and Iraq where PKK militants freely enter and resupply through. At the close of last year it was an action which could be quickly accomplished via overwhelming force and tactical surprise. In January however, two unexpected developments changed the strategic situation dramatically. January’s Turkish incursion into northern Iraq, instead of securing the blessing of the Americans, was implied by the latter to be a violation of Iraqi sovereignty – which the Iraqi government thus felt emboldened to vigorously denounce in international circles. A new ‘special negotiator’ empowered by the White House to supersede the activities of the Pentagon-embedded neocon faction previously running foreign policy in the region, had orders – and the authority – to bring the Turks to heel over the issue of their training and supply of the ISIL forces in both Iraq and Syria. He delivered this news in sequence on visits to the capitals of Erbil, Baghdad, and Ankara, as well as letting it be known that the Americans were opposed to any attacks upon the Kurdish YPG forces operating successfully against the jihadis in both countries! This shocked Ankara. McGurk’s [Brett – Special envoy] public and private messagescompletely undercut the stated pretext by which Ankara had justified sending armored units into neighboring Iraq – that they were assembling there as part of an international coalition’s advance against ISIL-held Mosul. Ever since the great power’s negotiations in the aftermath of WW 1 – which would set in place the political landscape which still reigns over the middle east – it has been the obsession of every Turkish regime to regain control of the former Ottoman protectorate of Mosul, and it’s oil rich environs. No one seems disposed to help them with this fantasy however. Even less so today. The second bit of bad news came from the opposite direction. The Russian’s inability to project their air superiority into eastern Syria and northern Iraq had been a mainstay of the pending plan’s attractiveness to all involved. Then news started filtering through about the presence of latest generation Russian AWACs appearing in those far away skies. It was only a matter of days before it was realized that they were flying missions out of bases in South Ossetia, and that their capabilities included signal fixing which allowed for directed missions against ground targets that needed to be eliminated. Certainly the planners in Ankara had to be aware of the already successful strikes over Syria by missiles directed from Caspian Sea-based Russian naval units. But the final nail in the coffin came with reports that Russian aerial bomber assets were being positioned to fly missions out of Iranian air bases. Instead of prioritizing the diminishment of tensions between the two countries as a result of the November shoot down of a Russian jet, Ankara was content to rely upon whispered promise of support from the NATO alliance against any Russian aggression. Meanwhile Russia had evolved a close tactical alliance with YPG Kurdish militias in operations against Syrian rebel groups. If long range bombers capable of precision strikes over the zone of intended advance were not bad enough news, the new attitude of their erstwhile western allies them to understand just how totally isolated they had become. There could thus be no guarantee of Russia not using their aerial superiority to protect those same Kurds against any Turkish offensive. Ironically, in the YPG-PKK Kurds the Russians now have a proxy force which can be more capably aimed at their enemy with destructive potential than Ankara’s dissolving jihadist proxy force can be used to similar effect! Any advance across the border into Syria would be casus belli for just that scenario to unfold – to Ankara’s acute discomfort. Betrayed, in their minds, by the perfidious Americans once again, and threatened on their flank by bellicose Russians, the Ankara regime had no choice but to back off of the Iraq adventure, and concentrate its army on pummeling its own southeastern cities into ruin. On the international front, instead of accepting the grudging reality of need to deescalate tensions with Moscow, Ankara threw all its weight into making common cause with all of Russia’s enemies. With Ukraine in particular, the regime has attempted to create a common front against the Russians, such that the latter needs to stay committed to fighting on potentially two fronts. Of course, this has simply played into the hands of its Kurdish opponents, who have been handed an opportunity to make an alliance with Moscow – which sees the same hand operating the levers of control behind both the middle eastern jihadis and the east European neo-Nazi extremists. It should be seen as no coincidence that YPG Kurdish forces are now receiving urban warfare training in Syria, as well as the weapons best suited for those special conditions. 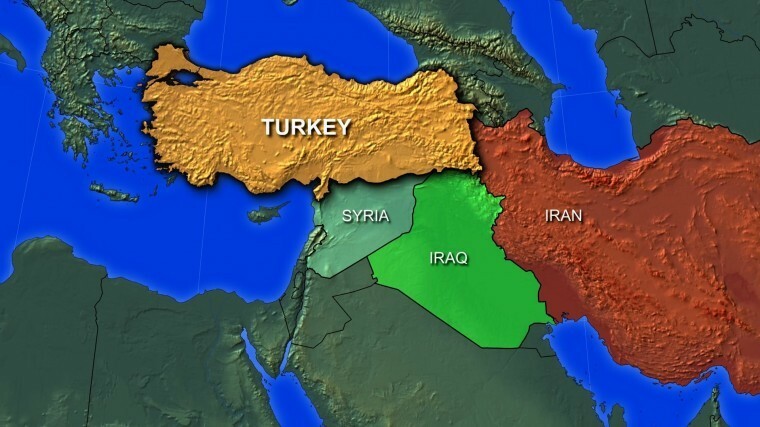 A porous border through which to send both gives the Syrian-Iranian-Russian alliance the means to keep Ankara’s own southeastern border regions in such turmoil as to serious undercut the logistical strength and stability needed for a foreign excursion by its own military. The Second Army in other words, cannot afford to leave home! And now, finally, we come to the last and most important piece of the puzzle. Last week there was a series of public statements from the mouths of several of the members of the governing AK Party in Turkey who were central in its startup and subsequent success. These old guard insiders purged by the Erdogan faction have for the first time come out publicly with expressions of dissent to the demagogic rule of the President and his extremist followers. As respected and well placed party heavyweights these persons represent an internal opposition to Erdogan’s reign of terror which cannot be dismissed or suppressed as being ‘coupist’ or ‘parallel’ – a huge shift in political dynamics. What this means in real terms is that there is a way opening up for the Armed Forces to focus on ending the slide towards suicidal foreign adventures and policy decisions that have effectively turned Turkey into a potential powder keg for a world war. Up until now, any move made by the military towards confronting or rebuking the Ankara regime would have resulted in speedy accusations of the kind of coup mongering for which there is zero support from any element of Turkish society. It would be a perfect storm by which the regime could decimate all remaining opposition in the military and civil society in short order. But the existence of a legitimate and well-placed internal opposition within the governing party itself changes everything. Erdogan’s new public opponents represent the sidelined – but not inconsiderable – moderate element of the AK Party, as well as a potentially huge groundswell of public supporters from outside its ranks, hopeful of reconciliation within and without the country before sectarian bloodshed starts to flow. As such, they offer the Armed Forces a means of confronting the Ankara regime in such a way as to be the voice of ‘the popular will’ – a status which the neo-Ottoman have jealously guarded for themselves to date! In light of the many previous coups by the military against the civil government in Turkey – the most recent of which was against the predecessor ‘moderate Islamist’ party to the AKP in the late 1990s, there is no popular support for an army led government at all. Even a gambit like a ‘temporary’ military government committed to elections would fail to gain public support. But turning down further adventurism in Syria, and turning out the religious extremists of the Erdogan faction of the AKP becomes an extremely plausible route – IF it can involve turning over power immediately to a legitimate continuance of executive authority in the form of moderate political figures whose popular support cuts across party lines in potentially creating an emergency government of national consensus. Because – keep this in mind – Turkey has indeed entered an emergency situation, in which its chances of staying whole, territorially, and out of a total civil war scenario such as Syria has been plunged into, are considerably less than 50-50. Fatal foreign policy missteps have created an economic tail spin not even begun to make itself felt. Add to this the drying up of Saudi largess, and other illegitimate income streams and you have a sea of domestic troubles to go with self-created foreign ones! Can Turkey avoid driving off a geo-political cliff? Stepping back from the brink will require that the true nationalists from the political sphere take a stand of moral courage which will set the stage for the true nationalists within the military to fulfill their duty to the nation. By handing its sovereignty back to its people, and away from those who’s driving personal ambitions and sectarianism have taken the country to the edge of violent dissolution. What will drive things towards this conclusion is the increasing awareness within the armed forces of just who, and by how much, has profited from the hidden deals between terrorists, terror states, and their political proxies. Unlike the hapless Turkish public, the military is not cut off from all news of malfeasance and corruption on the part of the leadership in Ankara. Legitimacy is a tricky thing to hang on to, once it starts to slip from one’s grasp. Today things are, though still very dangerous, therefore looking considerably less bleak than they have for the past several months. P.S. Today the Ankara regime announced that negotiations between the Turks and Tel Aviv had been ‘held up’ by the Israeli side’s wish to see Erdogan gone before an agreement. You can be sure that this smoke and mirrors is designed to hide just the opposite truth! The ground is creaking under the regime’s feet, as more and more AKP faithful find it incomprehensible how Ankara has run to Tel Aviv for help and protection! The limits of credulity have finally been breached inside the Islamist fantasy Caliphate.